After being long forgotten or regarded by some as just the subject of stories in the Bible, the Ark of the Covenant has now not only become the subject of much discussion, but has also become a much sought after artifact. 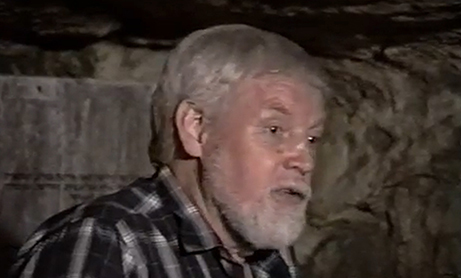 Ron Wyatt had not even thought about looking for the Ark when suddenly, while walking in the Garden Tomb area, his finger pointed to a certain area, and he said: “There’s Jeremiah’s grotto and the Ark of the Covenant is in there”. The man standing with him being a man of influence, told Ron he would help him obtain the permission required to excavate. But Ron had not consciously said those words, or even thought about what he was saying, and thus he felt the experience was somewhat supernatural. Did God want him to search for the Ark? ey could be connected to an execution site. He explains that the place he was digging felt unsafe and he started digging several meters to left of where he had first pointed, eventually digging a tunnel back to the original place, below the niches. Here he claimed to find an old Roman building foundation and a few cross holes. Noticing an earthquake crack extending from one of the cross holes he thought of the story in the Bible describing an earthquake when Christ died on the cross and that the rocks were rent. He was amazed by the idea that perhaps this could have been where Christ was crucified. Such cross holes, right at Golgotha’s Skull Hill not only proved that this was an execution site in Roman times, but it also showed the rocks were rent here, just like the Bible says. He thought the old Roman building could have been built by the first Jewish Christians as a memorial to where Christ died. But Ron was looking for the Ark and was left uncertain as to where to go from here. He had reached the bedrock. Going back up he felt impressed to break through the cliff face below the niches. Even he felt this might not be sensible as it was probably just solid rock, but after opening a small crevice he saw there was an open cave system behind the place he felt impressed to break through. Ron largely financed his excavations himself, so he had to return home often to earn money to continue digging. 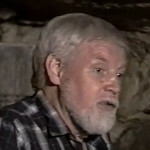 After returning to the site on one trip in 1982 he investigated the myriad of caves and openings inside the mountain and finally reached a cave that was filled to the roof with rocks. Underneath the rocks he could see the shimmering of something that looked golden. Excitedly he uncovered it finding what appeared to be the table of shewbread. Ron had thought perhaps it was going to be the Ark. Looking through the cave more thoroughly with his flashlight he could see a large stone box sitting near the cave wall. Its top was so close to the cave ceiling that he could not look into it, but noticed it’s cover had broken in two. Right above it, he noticed a natural crack in the cave ceiling with a brownish material on both the end of the crack and on the top of the stone lid where it was cracked open. He was completely shocked as he realised that this was the other end of the earthquake crack which he found by the cross hole, and that the blood of Christ had actually spilled down it, and onto the mercy seat. For years after, he could not even tell the story without tears in his eyes. Subsequently, when Ron investigated the crack he did indeed find it communicated with the cross hole 6 meters above. He managed to confirm it was the Ark of the Covenant in the stone box and the blood was analysed and proven to be unique. It contained chromosomes from a human mother but only one Y chromosome from a Father. Ron’s account of his discovery caused shock among some, and ridicule among others, but faith for those who believed him. He was called a charlatan and a deceiver and many tried to discredit him both as a person and as an amateur archaeologist. The Israeli government seemingly denied knowledge of him and his excavation – even though photos of him digging proved otherwise. The Garden Tomb told people not to listen to him and covered up the area of his excavation. During Ron’s excavation, Hollywood released their own movie about the discovery of the lost Ark, and several people began claiming they had found the Ark here and there. Ron’s testimony was suddenly drowned in a sea of other claims, and many felt that so many different claims might mean they are all false. If he was ever dreaming of fame or even for praise and honour, he certainly did not receive it! People didn’t even want to believe he had dug in the Garden Tomb. But despite all the mockery Ron continued to tell his story right up until his death. In his final interview on his deathbed in hospital, he was given the opportunity to clear his conscience, on record, and tell the truth: had he lied? Ron confirmed his story again and confirmed that he had told the truth. Did Ron find the Ark? Was the blood of Christ supposed to have fallen on the Mercy Seat of the Ark, or are one of the other alleged discoveries true? Perhaps no one has found the Ark? Can the Bible help and direct us in the unfolding of the true destiny of the Ark, and if it still has an unfulfilled purpose? Can the Bible expose the liars?